You may have heard some companies’ slogans sounding something like, “Our people make us great.” I recently saw a similar headline on the side of a corporate grocery store building. It’s refreshing to see companies valuing their employees and calling out their people as the magic ingredient. At Explore Horizons, we’ve been doing that from day one, and we really mean it! Our business is all about serving people. We want to get the most out of children and their learning abilities by creating a safe and happy environment where they feel comfortable and eager to learn. We believe that relationships are at the heart of this business. Without interpersonal skills, our tutors would struggle to be fun, engaging and effective. As a former Center Director, I can speak personally to this difference found in Explore’s learning center. The kids don’t just come here to learn. They know us, they know their tutors and they know what to expect when they come here, which is an inclusive and exciting environment with genuine support. So…how do they do it? What makes someone a great tutor? While all of our staff members are unique and diverse, we look for specific traits in all of them; attributes that allow them to build strong connections with kids and parents. We look for potential, passion and ambition. Once we find the right people, we work together to mold their skills into what we call the Explore Tutoring Approach. In this month’s blog entry, we will review our unique Explore Approach, as well as hear from a few of our current Superstar Tutors. We asked some of our top performing tutors to give us an inside look on what it takes to be an effective tutor. Garrett has worked as an Explore Tutor for two years and is commonly named by kids and parents alike as a fan favorite! He’s also received numerous accolades from his management team, positioning himself as a strong leader on his team. A successful tutor also adapts to the needs and personalities of each child in their care. Another veteran tutor, Kelsey, reflected on a stand-out moment in her career. Our veteran tutors are not only role models for the kids, but they set a notable example for our rookie tutors on a day-to-day basis. Alyssa began working for Explore in February and has since been moving forward as a wonderful tutor with the help of some of our vets. 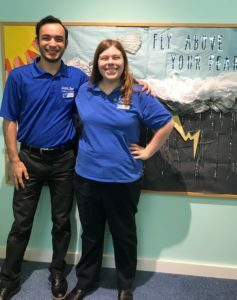 Inclusivity is something that we try to instill in all our tutors and Cheyenne, a tutor that has been with us for years, is especially known for setting the best example for the tutors, but also the kids. Tutors like Cheyenne are what keep our members and tutor team growing. “I love working at Explore Horizons. The team is always helpful and very welcoming. 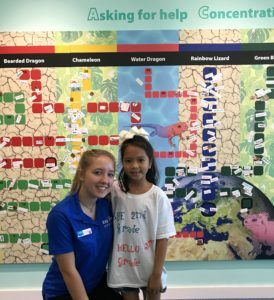 Even the families have welcomed me into the center with open arms and that kind of atmosphere is what helps me excel as a new tutor,” said Alyssa. The examples our tutors set for each other and the kids are a huge part of why we are successful and why we have been able to continue growing our membership, touching the lives of hundreds of families. We are constantly looking to impact as many people as we can. Our tutors often encourage their peers to join the team. Kelsey mentioned that two of the biggest keys to communicating with kids is to be open to listening. When the kids know you will listen to anything and everything they have to say, they can begin to build a relationship with you. This builds trust with the kids and that is the most important key to maintaining that bond. I know it sounds cheesy but as you can tell; our people really are what make us great. If we didn’t have these tutors we wouldn’t be able to touch as many lives as we do, and we really appreciate our tutors more than they could ever understand. Shout out to our fabulous team! And as Garrett said, we encourage anyone who is just as passionate as we are, to apply and potentially begin a rewarding professional journey with Explore. Abbey and Melissa (Abs & Mel) are the authors of the Explore Horizons Career Blog! Abbey has worked with Explore Horizons for over 3 years, and is now managing recruitment, training, and HR for the organization. Her passions lie in developing people professionally and impacting the lives of children. Melissa started as an Assistant Director recently, and has truly blossomed into an Explore Ambassador since starting her career. Her passions for education and leadership are coupled with a unique talent and excitement for digital marketing, which is why she’s chosen to impact the business via blog-writing! Please submit any inquiries or requests for the blog to recruitment@explore-horizons.com.